We started running these surveys in 2013 to stay in touch with our developer and DevOps communities, and to understand how they work and the challenges they address on a daily basis. This year’s survey ran from August 25th through September 3rd and received more than a thousand responses, from over 50 countries, mostly, the US and Europe. One of the clearest findings in this year’s survey is that developers and DevOps are using more and more development technologies in their daily work, some using as many as six or seven different formats at a time. 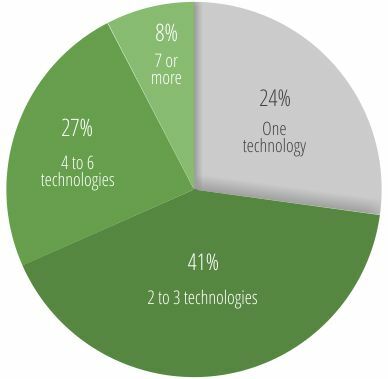 An overwhelming 76% of developers surveyed indicated they used more than one development and packaging technology in their most recent project. This was especially true for Docker users, 91% of whom indicated that they use two technologies or more (27% indicated that they use six technologies at a time). We mentioned this in a previous post where you can see the stats from the survey specific to Docker users. If you want some more insights on how developers and DevOps work in today’s highly diversified environments, and how things have changed since 2013, feel free to download our analysis of the results. We look forward to your participation in JFrog Developer and DevOps Trends 2016.